Green Lotus Saksham offers spacious rooms with maximum sunlight and natural air flow in each room. These 2 BHK flats in Zirakpur provide an ideal home at an affordable price for all those who have just started a family or are looking for a secure yet lovely place to settle with family. These 2 bhk flats for sale in zirakpur provides two spacious bedrooms with one of them being around 15 feet wide which provides ample space for your bedroom. 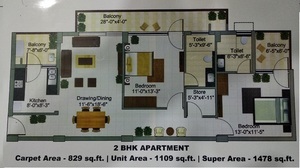 Every 2 bhk flat has two bedrooms with attached bathrooms, drawing room, dining room and modular kitchen. The apartments have rich and eclat interiors with modern architecture and luxurious furnishings. The living room is 18 feet long with foyer entrance of about 5 feet wide. A beautiful modular kitchen opens toward a spacious balcony with beautiful view of green fields. Other than the balcony attached to the kitchen there are two additional spacious balconies with both being around 11 feet in length. A 5 feet by 4 feet store room provides good amount of space for storing the favorite toys of your kids. The futuristic design of the homes enables them to provide their residents with convenience, comfort, and luxury which is reflected in the sample flat images below. Built in an area of 1385 square feet, each 2bhk apartment has been allotted space for the parking of one vehicle in the covered, underground parking of the society. The date of possession of these flats in the Green Lotus Saksham is in the year 2021.